A Gamma Ray Burst is, well, a burst of Gamma Rays. That is, a short lived "flash" of very high energy radiation. A typical Gamma Ray Burst, or GRB, gives off a similar amount of energy to a supernova, but it does it in a few seconds, making GRBs around 10,000,000 times brighter than your average supernova. If you were to take a typical kettle, and boil it non stop for 200,000,000,000,000,000,000,000,000,000,000,000, years (that's 15 million million million million times the age of the universe) you'd use up the amount of energy a GRB gives off in about 10 seconds! Because they're so bright, we can see them from a long, long way away. In fact, the most distant object ever seen by humans (at least, where we are sure of the distance) was a GRB: GRB 090423. The problem with GRBs is that, if they only last around 10 seconds, it's pretty hard to get any telescopes to look at them and therefore to actually learn about them (which is why Swift was built). Fortunately, the short flash of light is not the end of the story. We also get something called an "afterglow" which, as you've guessed, is a glow which comes after the GRB. This lasts anything from a few hours to days or even months. 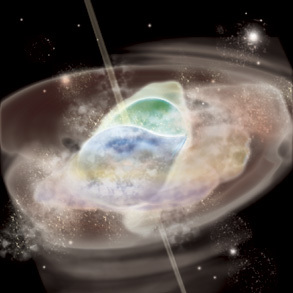 The afterglows are usually detected by X-ray telescopes, often detected by optical and infrared telescopes, and sometimes by radio telescopes as well. What do the numbers in a GRB's name mean? You may have noticed GRBs don't have names, but numbers, like GRB 090423, above. There are too many GRBs to name (in fact, most stars are known by a number, not a name), instead they are given a number based on the date of the burst. The dates are "backwards" compared to how we normally write them : Year,Month,Day. So, for example, GRB 090423 was detected on 2009 04 (April) 23rd. Nowadays we also put an "A" on the end of the number to signify that it's the first burst of that day. For example, in March 2008 there were 4 GRBs, GRB 080319A, 080319B, 080319C and 080319D. Coincidentally, the second of these (B) was incredible. It was about 7.5 billion light years away... and bright enough to be seen with the naked eye (if you looked in the right place at the right time). But what actually is a GRB? We don't know absolutely, definitely, for sure what a GRB is. There are (at least) two types of GRB called long and short GRBs, because long ones (usually) last longer than short ones. Long GRBs we think represent the death of a massive star, as the picture on the left illustrates. The star eventually has so much iron in its core that it simply gets to heavy to hold itself up and the core collapses into a black hole. This releases a lot of energy (even more than the kettle-boiling marathon above), some of which gets channeled into 'jets' as you can see in the picture. If this jet happens to be pointed at the Earth, we can see it as a GRB. We have lots of reasons to believe this is what causes long GRBs. For example, long GRBs are always found in galaxies with lots of massive stars, and when we have really good data we can even find that they're in the parts of the galaxy where the massive stars are. Also, if a GRB is the death of a massive star we should also see a supernova from the star a few weeks after the GRB. Supernovae are not as bright as GRBs so we can only spot this for nearby bursts, but for those nearby bursts we've followed closely, we do see the supernova as expected. The picture for short GRBs is less clear. They are found in all types of galaxy, including those with no young and massive stars, so they can't be the same a long bursts. Instead, the favourite model is that two very dense, old stars called Neutron Stars are orbiting each other and they spiral in until they merge and form a black hole. 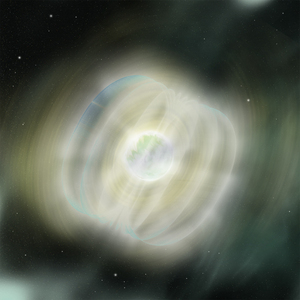 A typical Neutron Star is quite massive -- two or three times more massive than the Sun (so weighing in at around 10,000,000,000,000,000,000,000,000,000 tonnes) but very small, only about 10 km across. As you can imagine, if two of these merge and collapse to a black hold again there is plenty of energy given off, although typically around 10 times less than from a long GRB. This energy is fired in jets, like a long burst, and if we're lucky we lie along the jet and can see it. Although the merging stars picture is the most common one, it's not the only idea for where short GRBs come from. Many people think that at least some short bursts come from magnetars. These are neutron stars with really strong magnetic fields (an artists impression is to the left) and we sometimes see big flares from them. This happens because the magnetic field gets so twisted that at some point the field lines can break apart, and then reconnect, releasing loads of energy in the process. A really energetic flare from a nearby magnetar was detected in 2004 and it has been suggested that, if the magnetar was in a distant galaxy we would have detected it as a GRB. How often do GRBs occur? If you had an ideal detector that covered the whole sky, all of the time, we'd detect about 2 per day on average. Swift looks about 1/6 of the sky at any given time, so detects around 100 per year. Why do we care about GRBs? GRBs are really useful objects to study for many reasons. As you can see, we don't fully understand them yet (that's an understatement!) so we can learn a lot not just about GRBs, but about physics and how stars work by studying these objects. Also, they're so bright that we can see them a long way away, and study the Universe in its youth using GRBs. And of course, we can study the universe between us and the GRB because the burst is lighting it up for us!